with Craig Dremann of The Reveg Edge, from 2003. Consulting on native plant plantings and reintroductions since 1972. 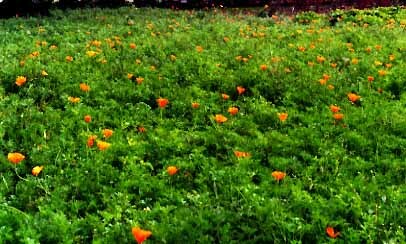 California poppies planted as a vineyard ground cover in Central California. Establishing a planting of California wildflowers can be very difficult and frustrating, unless you take into consideration the reasons we don't have abundant wildflowers covering our California hills and roadsides any more. The principle problem is the introduction of exotic plants, mostly from Europe, which give off natural herbicide-like chemicals, called "allelochemicals", as they grow. When you look at the California hills in summer, all the grasses that have turned brown are from Europe, and did not grow here until the seeds were brought to California about 150 years ago. Almost all the California's native grasses that you would find growing on the sunny hillsides were low-growing perennials about a foot tall that stayed green all summer without any water. The native grass plants grew in little clumps, with spaces between them where the wildflowers grew, and are called "bunchgrasses". When the California flag was designed in 1850, these bunchgrasses were still so common, that they were put on our flag. You'll see the Grizzly Bear walking over a California native bunchgrass prairie in February. 1.) Let the autumn or winter rains germinate the weed seeds in the soil, and make sure you till out all exotic seedlings that come up before you plant your wildflower seeds. It may take two tillings to accomplish this task. 2.) Sow densely! You might hear recommended sowing rates of 5-10 pounds of wildflower seeds per acre, but those low rates do not even begin to allow the wildflower seedlings to have an edge over the exotic annuals. For decades, these low sowing rates have been used without any success in California. 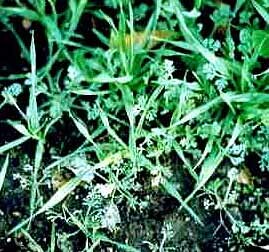 For any wildflower or native grass seed, you need to sow a MINIMUM of 50 pounds of seed per acre, and 100-200 pounds is better if you know you have an exotic problem in the area. That means one pound, which is about one quart of seed, will cover 200-500 square feet. ALWAYS SOW INDIVIDUAL SPECIES of wildflowers, never mixes. If you look at a natural wildflower area in California, you will see that the species group themselves as swaths, not mixes. It is more of a mosaic, and if you imitate that pattern you will have greater success. You can always sow more than one species, just plant each one as a separate swath. Normal wildflower swath sizes are about 20 feet wide by 50-100 feet long. 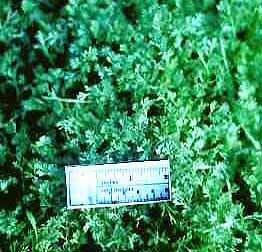 CHECK YOUR PLANTING when your wildflower seedlings are about 2 inches tall. If you see a lot of exotic seedlings in the planting, it probably would be best to retill and resow the wildflowers because it is unlikely that the wildflowers will succeed. IF YOU DO HAVE SOME WEEDS IN SPRING: Two passes with a mower, once in the first week of April and a second time in the first week of May, cutting no lower than 8-10 inches high, can help control weeds in Coast Range plantings (Crescent City to San Diego). Inland, in the Sacramento or San Joaquin valleys, mow about one month earlier for both dates. The photo on the left shows what your planting should look like by the time the seedlings are a few inches tall. The photo on the right was sown and photographed at the same time but only a few feet away from the area shown on the left. You can see the exotic annual European grasses inhibiting the growth and stunting the California poppy seedlings, where weeds were not tilled out completely, and where the wildflower seeds was not sown densely enough. Within two-three months, this is what your wildflower planting should look like, solid wildflowers without any exotic weeds. This area was planted at the Kendall-Jackson winery in Fulton, California based on our specifications and recommendations in February, 2000. Photo was taken in fall after a spectacular blooming season. OUR FIRM specializes in consulting on how to get wildflower planting established. If you want to have a successful display in your area, call today.